Hi Friends. It's me, The Bean. Today is Procrastination Donation Day. For those of you out there who have been planning on making a donation to fundraiser, but just haven't gotten around to do it, well, today's the day. I understand waiting until the last minute to do things, believe me, I'm the very same way, but this IS the last minute. We've got just 13 days until the fundraiser ends. 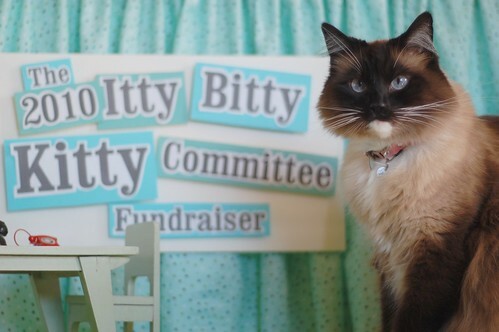 So please, hurry on over to the Dog-A-Thon donation page, and help a kitty out. I just made my pledge and I feel MUCH better now. What makes me think you'd like your donation to go toward glitter balls at the shelter? I just donated and I DO feel better! Hey, that's a great idea, anonymous #1. For those daily challenges you have, Laurie/Charlene, you should ask people to donate a certain amount based on the number of glitter balls (or just cat toys) they have lying around. This litter is a regular United Nations! Betty June, Marie-Noire, Camille, Biscuit and Ve Ching. Wait, aren't those Brad and Angelina's kids' names?